Multi-tasking Made Easy It is rare to see a MasterCraft on the water these days without spotting a plethora of take-along gear. The classic slalom ski has adopted a bevy of brethren, including wakeboards, kneeboards and even a flying tube. Whatever your preference, the X-7 has the perfect pull. As holder of every significant skiing record and the only boat ever approved for all 5 competitive events, it has the mojo to do things no other boat can. Engine, wheel and throttle management is a snap. With MasterCraft’s standard multi-port electronic fuel injection for turn-of-the-key starting, smart rack and pinion steering system for needle-like precision and standard MasterCraft Cruise and drive-by-wire technology for holding speeds within .2 mph, the X-7 makes instant magicians of anyone in the driver’s seat. Framed in MasterCraft’s tournament-bred, all-composite LifeMaster construction method, the X-7 is built for a hard long duty, carrying a lifetime warranty. 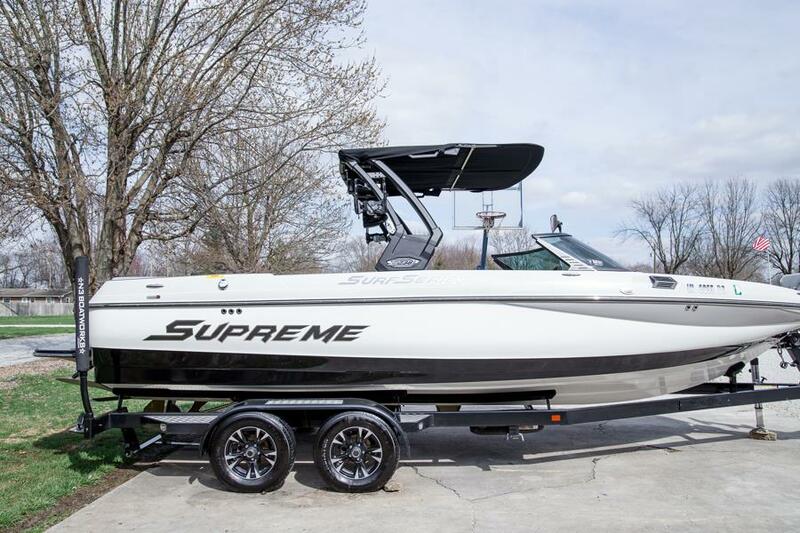 Seventy-five, 50 or 20 feet behind, things are equally exhalted, where slalom skis, wakeboards or wakeskates dance on wakes that are clean, rounded and perfectly proportioned for your discipline of choice. The X-7. Multi-tasking. Made easy.